Saudi Arabia may havae sent its 30-year-old deputy crown prince to visit the United States due to the deteriorating health of King Salman and amid rumors that Prince Mohammed bin Nayef is ailing as well. 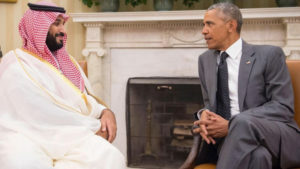 Deputy Crown Prince Mohammed bin Salman met with U.S. President Barack Obama on June 24 to “reaffirm the strategic partnership between Riyadh and Washington,” Bruce Riedel, a former national intelligence officer, told NBC News. Reports this month say that King Salman’s health drastically deteriorated and visitors have been barred from seeing the aging monarch. Sources close to the Saudi monarchy say the 80-year-old king is suffering from dementia and is struck with periodic blackouts and an inability to speak. While Prince Mohammed bin Nayef is officially first in line to the throne, it is King Salman’s young son Mohammed bin Salman who is widely reported as being most likely to be the next king of Saudi Arabia. “We’ve put a lot of markers down on Mohammed bin Nayef. It’s the smart move to do the same with bin Salman. It’s an opportunity to get to know him,” Riedel said. The young prince’s meetings with Obama, Secretary of State John Kerry and others are an indication that Washington has apparently conceded his succession is “a very real contingency,” said Riedel. One source told a Middle East website said that bin Salman’s trip to Washington was “designed to make him the U.S.’s number one Saudi ally and to push [bin Nayef] out of the scene”. There have been conflicting reports on the health of bin Nayef, with some sources in Ryadh saying the 56-year-old was physically fine and recently went on a hunting trip to Algeria.